You guys remember that Bond film, right? Rhinestones are forever? If not forever, per se, they are at least decent amounts of time. “Rhinestones are decent amounts of time” doesn’t have the right ring, however. It’s not exactly catchy. Today I’m wearing my Goodwill bow bracelet, my sterling knot from Hiho Silver, and a vintage rhinestone piece I was given for being a bridesmaid. Best yet?? Rhinestone panda clip ons. Now pandas, they are forever. “Rhinestones are decent amounts of time” made me LOL! That was a good one. Rhinestones are a girl’s best acquaintance? I don’t know I’m not good at this. 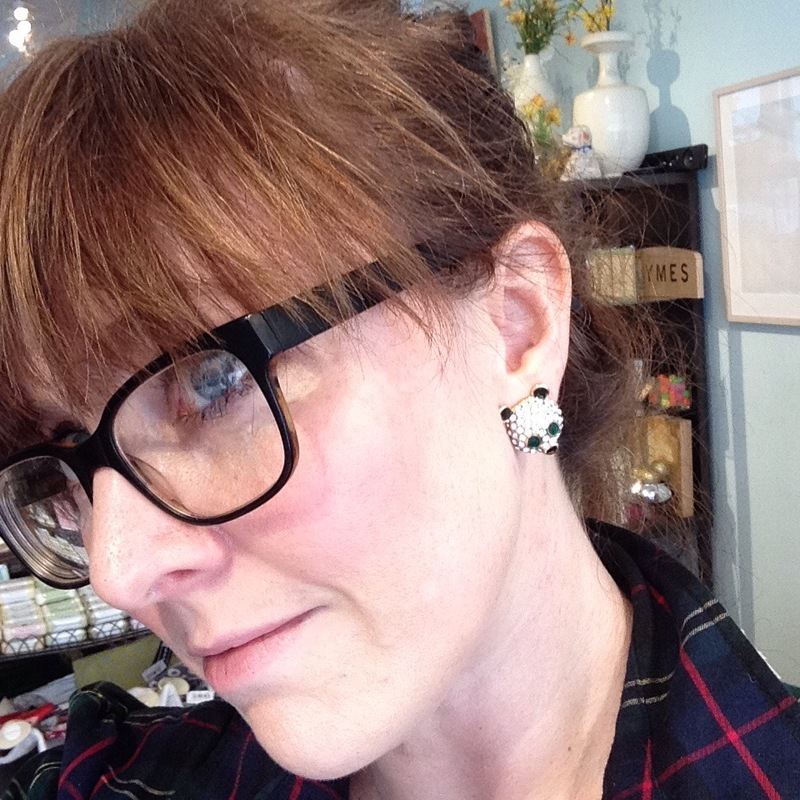 Those panda earrings are adorable! 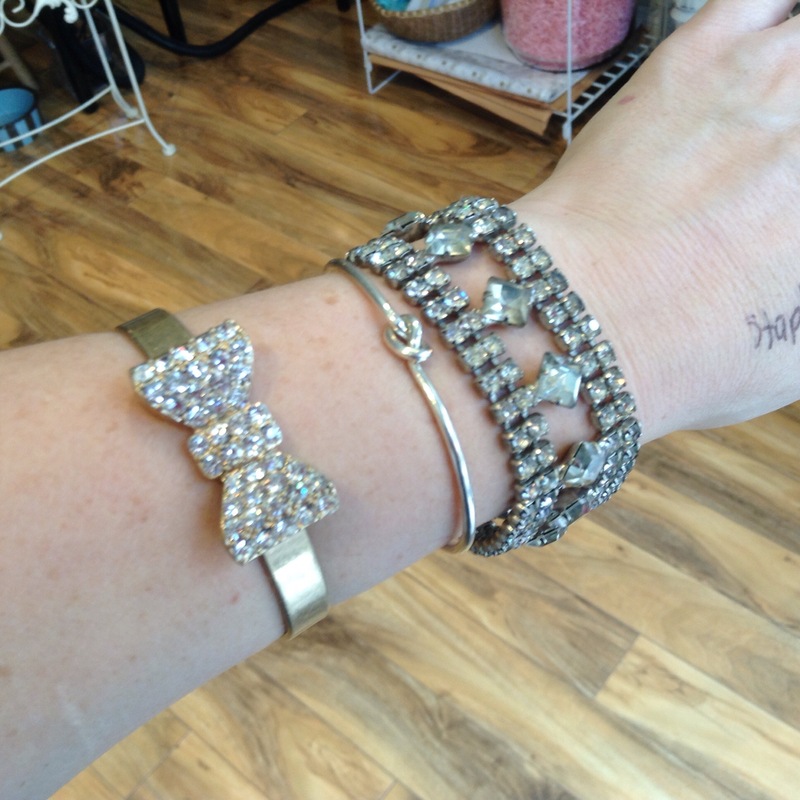 What do you think of Jennifer Meyer’s jewelry? I don’t know her stuff! I’m looking it up now, seems pretty sweet darling kind of things. Do you wear her jewelry? No I do not where it, it’s all a bazillion dollars. I only know her because she’s married to Toby Maguire and I’ve seen her designs in magazines and on celebrities. Just curious what you thought. I like some of her really simple pieces I’ve seen in the past but I’m not sure I’m into the other stuff. I just clicked on a cute one and saw the 3k price tag. YEOW!! The wife of Toby Maguire that explains why she looks kind of familiar. All these wives and their jewelry lines. If it’s not jewelry, it’s like bed spread designer. SMH. I’m not sure if it’s intentional, but that middle bracelet–the simple, silver one–looks awesome for a gift to wifey. I like its simplicity and its dainty quality! I was just about to say the same thing. I mean not as a gift to MY wifey. But as a lovely gift to all wives and non wives in general. I got it from a shop in SF HiHo Silver (www.hihosilver.com) I’m not finding all their products on their website though. But they are super friendly. If you phone them (the owner is Victoria) and ask about the thin knot cuff, they’d be very helpful. I think I paid $65 for it? Maybe less even. Which sterling silver artisanal pieces that’s a pretty good price in my book. What is that written in your hand? Does it say staples? Are you cutely reminding yourself to buy staples?? Stahp. The panda earring is adorable as it is. Staple… Gun! I’m cutely reminding myself to bring home the old staple gun.